Representatives of Island not-for-profit groups are invited to take part in an information session about the Common Good Retirement Plan, which aims to create a national, portable retirement income plan for Canada’s non-profit and charitable sector. 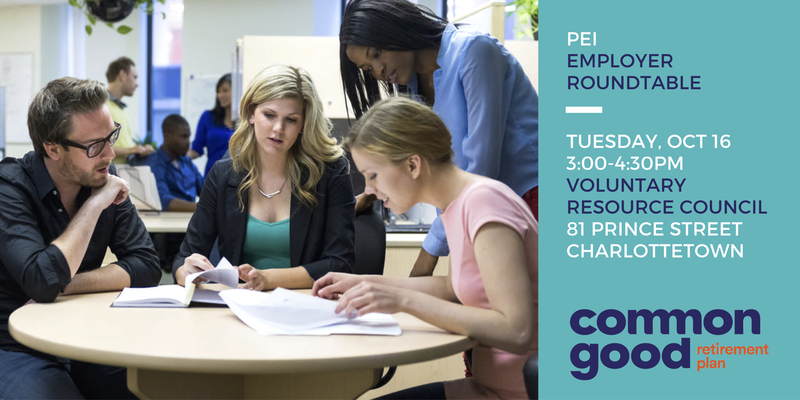 Cooper Institute is hosting an Employer Roundtable information session about the Common Good Retirement Initiative. This will be a two way virtual meeting with colleagues in Toronto to provide an opportunity to learn about and discuss the initiative. Common Good aims to create a national, portable retirement income plan for Canada’s non-profit and charitable sector. This event will be of interest to leaders of non-profit and charitable organizations interested in enhancing retirement security for their employees. This includes organizations of all sizes, and organizations that currently offer retirement benefits to employees as well as those currently offering no retirement benefits. Alex is a Founding Partner at Common Wealth, a Toronto-based company dedicated to expanding access to good retirement plans and strengthening retirement security and the Technical/Operations partner for Common Good. In partnership with SEIU, Common Wealth recently created my65+, the first retirement plan for lower- and moderate-income workers in Canada. He recently co-authored a report for the World Bank on lessons learned from the evolution of the Canadian pension model. Alex has advised governments, unions, associations, international financial institutions, startups, and pension funds with collective assets exceeding a trillion dollars on a wide range of pensions and retirement-related issues. In 2015, Alex was appointed as a special advisor on the implementation of the Ontario Retirement Pension Plan. Alex is a regular speaker and commentator on pensions and retirement issues in both Canada and the US, including as part of such forums as the Brookings Institution, the Aspen Institute, Forbes, the Globe and Mail, the Association of Canadian Pension Management, and Pensions and Investments. Common Good is currently conducting a six-month sector engagement process to inform the design and viability of a potential sector retirement plan, and to inform a decision (to be made in Fall 2018) on whether to move forward with implementation. It is also looking for employers who would be interested in offering the Common Good plan to their employees if the plan were made available. A decision about whether to move forward with the plan will be based on the level of interest from the sector. There is no cost for this session – but please register beforehand!